Applications of sacred geometry, and number mysticism in Egyptian temples to generate cosmic energy. 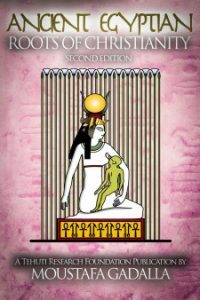 This new expanded edition reveals the Ancient Egyptian knowledge of harmonic proportion, sacred geometry, and number mysticism as manifested in their texts, temples, tombs, art, hieroglyphs, etc., throughout their known history. It shows how the Egyptians designed their buildings to generate cosmic energy; and the mystical application of numbers in Egyptian works. The book explains in detail the harmonic proportion of about 20 Ancient Egyptian buildings throughout their recorded history.It also includes additional discussions and details of the symbolism on the walls; the interactions between humans and the divine forces; Egyptian tombs, shrines and housing; as well as several miscellaneous related items. Everything that the Ancient Egyptians built/molded/sculptured was for the purpose of generating energies and/or to embody energies. And just like our electrical system that needs activation by turning a switch on, all Egyptian works also require/required activation by the right actions [sounds, gestures, etc.]. And while these ‘stone’ marvels appears static because they appears stationary, they are no different than [stationary] energy generating units—like our solar panels that absorb solar energy from the sun and convert it to energy supply for our earthly human needs. 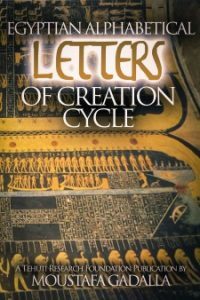 This book reveals the Ancient Egyptian knowledge of harmonic proportion, sacred geometry, and number mysticism, as manifested in their texts, temples, tombs, art, …etc., throughout their known history. It shows how the Egyptians designed their buildings to generate cosmic energy, and the mystical application of numbers in Egyptian works. The book explains in detail the harmonic proportion of about 20 Ancient Egyptian buildings throughout their recorded history. It is the aim of this book to provide such an exposition, one which, while based on sound scholarship, will present the issues in language comprehensible to non specialist readers. Technical terms have been kept to a minimum. These are explained, as non technically as possible, in the glossary. This Expanded Edition of the book is divided into three parts containing a total of 13 chapters, as well as 10 appendices being A through I. 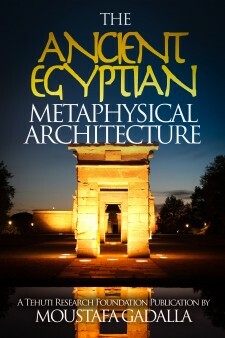 Chapter 1: The Architectural Canon will cover the deep-rooted Egyptian beliefs of ‘As above So below’ and its application to Egyptian art and architecture and the existence and adherence to a divine building code, as well as utilizing design and construction plans prior to as well as during the construction stages, which extended over several centuries for large projects. 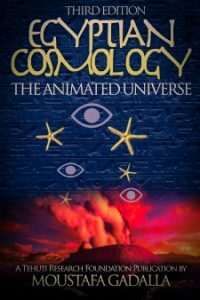 Chapter 2: The Metaphysical Structure of the Universe will cover the realms of creation and its correspondence in Man as the image of all creation. Chapter 3: Visitation Sites of The Lower Heavenly Court will cover the interactions between earthly living beings and the lower realms of the metaphysical cosmic structure, the significance of landscape architecture in such interactions, and the major types of visitation buildings (both burial and non-burial sites) to facilitate such interactions. Chapter 4: The Sealed Pharaohs’ Tombs will cover the concept and role of the pharaohs which requires their tombs to be sealed and inaccessible for further communications after their earthly existence, as well as giving samples of some pharaoniac tombs. Chapter 5: Egyptian Temples of the Divine Forces will cover the main function of Egyptian temples (being divine generation), the overall conceptual temple layout, the metaphysical funnel conduit design, the generative significance of jointing patterns, outer walls’ physical/metaphysical protection, and the organic foundation roots of the Egyptian temple. Chapter 6: Architectural Constituent Forms of Metaphysical Functions will cover the various architectural forms as manifestation of their corresponding functions [both physically and metaphysically] for “false doors”, recessed wall panels, columns and pillars, capitals of columns, porticoes, peristyles, colonnade formations at four different locations, obelisks, statuary images, various roof forms (flat, gable, corbelled, arch and vaulted), stylistic architectural details (architrave, cornice, and torus) and stylistic ornamentation and decoration such as starry ceilings, floral, geometric, figurative, or a combination of two or all three, guilloche (misnamed as the Tuscan border), chevron, and scroll patterns. Chapter 7: The Primary Geometrical Shapes/Forms will cover the principles and application of sacred geometry of Divine Architecture, the Egyptian sacred cord [tool], a general layout of sample geometric shapes, the sacred circle as the archetype of Creation, squaring the circle, the primary triangles, and the combined square-triangle 3-D pyramids. Chapter 8: The Generative Square Root Rectangles—”Irrational numbers” will cover the generative root rectangles as the hypotenuse of right angle triangles, beginning with a square and generating square roots of 2, 3 and 5; the formation of cosmic solids; the generation of the Golden Proportion from the root five rectangle; the construction of whirling square spirals; and example applications of this form of dynamic design to four locations in Ancient Egyptian monuments. Chapter 9: The Arithmetic Generative Progression will cover the role of numbers as generators of orderly growth and progression, the Summation Series and the Golden Proportion, and the Cosmic Proportion of the Human Figure. Chapter 10: Combined—Arithmetic and Graphic Harmonic Design of Egyptian Buildings will cover combining both the arithmetic and graphic elements into a harmonic design of the parts and the whole of an Egyptian temple that includes: active axes, significant points, the telescopic triangles, and rectangular perimeters in both the horizontal and vertical planes. Chapter 11: Harmonic Analysis of Ancient Egyptian Works will cover several examples from Ancient Egypt from all eras and throughout Egypt that show Egyptian applications of the design elements discussed in this book. Examples include temples, tombs, pyramids, shrines, capitals of columns, stelae, pylons, and doorways. Chapter 12: The Animated Metaphysical Images on Walls will cover the metaphysical significance of wall decorations as well as explanations of various depictions. Chapter 13: Human Activities will cover the roles of humans in activating, maintaining, and participating in various rituals and festivities as well as deactivating the powers of the temple when temples and the whole of Egypt is under siege. Appendix A: General Plans of Sample Egyptian Temples covers layout plans of several Egyptian temples, with a short description of each. Appendix B: Practical Mathematics in Ancient Egypt refers to the four most recognized Ancient Egyptian “mathematical” papyri and the practical mathematical contents within such papyri. Appendix C: Fraction Mysticism covers the reasons that, in Egypt, a fraction—any fraction—could only be a fraction of unity and Egyptian tables to deal with “complex’ fractions which are similar to modern Logarithmic Tables. Appendix D: Intentional “Irregularities” In Egyptian Works covers the religious reasons for what seems to be “irregularities” in the highly-executed Egyptian works. Appendix E: Monument Appropriations Reconsidered clarifies what appears to be monument appropriation by one pharaoh, of another. Appendix F: Sample Egyptian Sculpture Works covers a very short list of recognizable Egyptian sculptures. Appendix G: Concrete Blocks Various Types covers the advanced Egyptian knowledge of concrete mixes and application examples of such knowledge throughout Ancient Egypt. 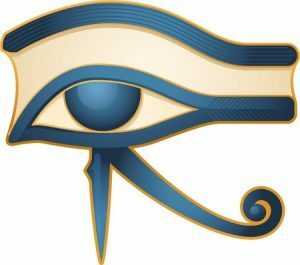 Appendix H: The Masonic Egyptian Roots covers the Egyptian roots of the widespread secret fraternal society called ‘Free and Accepted Masons’ (popularly known as Freemasonry). Appendix I: Egyptian Influence on Modern Architecture covers several worldwide examples of such influence. Appendix J: Types and Forms of Mortals’ buildings will cover types and forms of residential, private, communal and public buildings as associated with its earthly existence’s function, as well as highlighting that mortals of all classes—including pharaohs and priestly staff—resided in mud-brick houses.